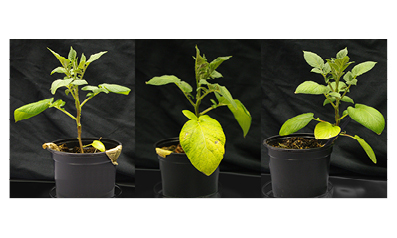 Potato virus Y (PVY) is the most economically important potato virus, therefore extensive research is focusing on elucidation of its interaction with the host. To obtain repeatable results, strict standardization of research methods is crucial. Mechanical inoculation by rubbing sap from a PVY infected plant onto the leaf surface together with a fine abrasive powder is the most convenient way of experimental transmission of PVY to host plants. However, factors determining reproducibility of this process need to be determined. In the present study, it was shown that higher titre of the virus in the inoculum resulted in faster increase of PVYNTN RNA titre in the inoculated leaves, as well as in faster translocation of PVYNTN from inoculated leaves into upper non-inoculated leaves. The final titre of PVYNTN RNA in upper non-inoculated leaves was independent of the virus titre in the inoculum. In addition, the occurrence of the disease symptoms was followed and the dependence to the titre of the virus in the inoculum was observed.